Try make your own kite and fly it, this would be one of the happiest moment of your life. Your kids will love you more than the world, if you make a kite for them. This very interesting kite design. Here we create a kite man, a kite shape look likes a man. This kite design is little complex that previous design. But it is not very difficult to try it. If you a kids please take assistance from your parents to make this nice kite. For this design also we need same materials as previous. 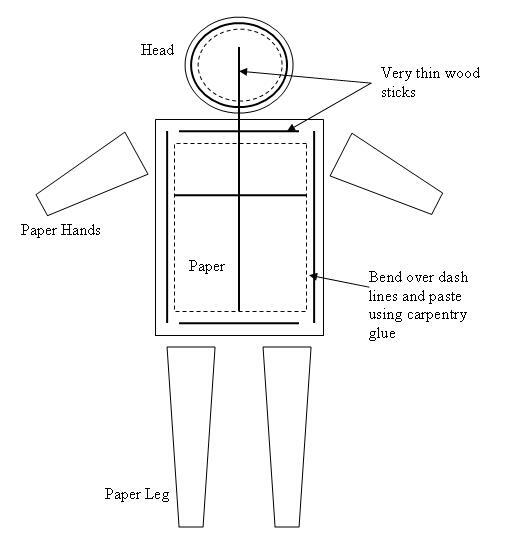 As shown in figure 1 you need to cut your paper sheets. You can use different colors to different part of the human body. Then mark the dash lines as shown in figure. 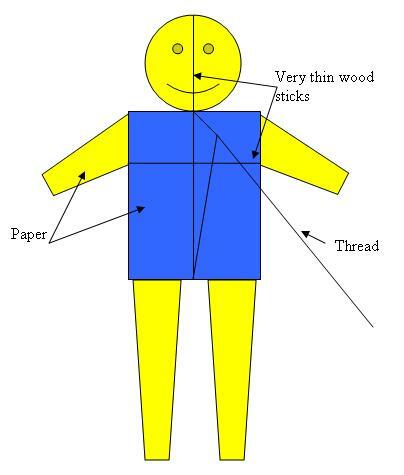 Paste prepared wood sticks as shown in figure. It is very important to take very light weight wood sticks for this kite. Then bend over the dash lines and paste the edges of the paper sheet. Now body part of the kite man is completed. Next will move into how to make a head for our kite man. Take another very thin wood stick, bend it to make a circle and tide the edges and make the wood ring. Fix that wood ring to body of the kite man. Using some different color paper sheet paste it on the wood ring to make face. Now almost done, need to complete the body of the kite man. Using different color paper sheet and cut the hands and legs for the kite man and paste them as shown in figure 1. Next thing is give him eyes, nose and mouth. 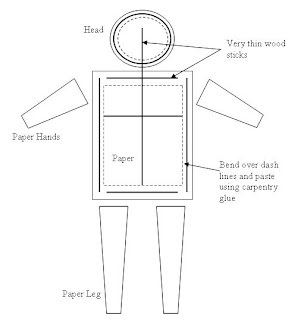 Cut two small paper circles for eyes, triangle for nose and mouth shape paper pieces and paste them on the face of this kite man. Final kite man will look likes this. Finally as shown in figure 2 you need to fix the thread for this kite. Fix the thread to neck of the kite man and other end to bottom of the kite man. Then fix your thread reel to middle of previous thread. Now we are ready to fly our kite man. Hurry to nearest beach or any place that you try to fly this kite man. Fly this kite man and how he smile at you and dance on the air. How well does this fly? I bet you need lots of wind to get it up in the air. But it looks like a one of a kind kite. A while ago i made a big Parafoil Kite out of Tyvek. It's the white plastic they use to wrap houses in. It worked great, it was free and super strong.